Physical Description: 293 p., ill., 21 cm. Nothing exciting has ever happened to Lettie until the night a strange merchant appears. He claims to be an alchemist--the greatest that ever lived--and he is here to sell Lettie his newest invention. It's an invention that could change Lettie's life and the world forever. An invention called "snow." But snow is not the only secret he holds. 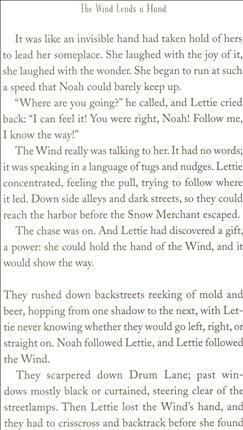 The alchemist knows where Lettie's Ma is. And Lettie will do anything to get Ma back--even if it means risking her own life. School Library Journal - 12/01/2015 Gr 4–6—Twelve-year-old Lettie Peppercorn's "joint best friends" are the wind and a pigeon named Periwinkle. She is the landlady of the White Horse Inn, a run-down building on stilts created by her absent alchemist mother. Money is scarce, since her Da drinks and gambles away their meager funds. Lettie is alone in the Inn except for the Goggler and the Walrus, two demandingly irritating female guests, when a strange, evil man with an icicle beard arrives. His name is Blustav, but he calls himself the Snow Merchant, and he has come to peddle snow to Lettie. He arrives on a boat piloted by a young boy named Noah. The two women and Lettie behold the alchemical creation of snow and think it's diamonds. Lettie now believes her money worries are over, but the nefarious guests plan to steal the Snow Merchant's product for themselves. When Blustav lets slip that he knows the young girl's mother, Lettie and Noah give chase, hoping that the sinister man might lead them to Lettie's missing mom. The tale is peppered with enjoyably ludicrous occurrences: Noah has a green shoot growing out of his shoulder that provides nourishment in times of need, and Blustav turns his enemies into their last meal (Lettie's dad becomes a beer bottle, and the Walrus's head turns into a teapot). Bernatene's atmospheric illustrations are full of intriguingly whimsical characters who add a deeper layer to this imaginatively odd story. 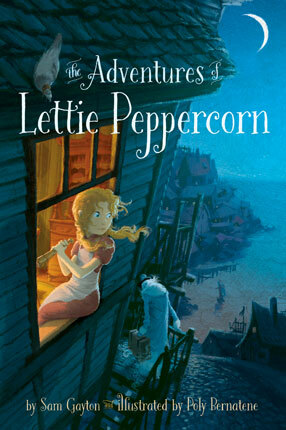 Lettie's loving determination to reunite her peculiar family, along with the bevy of magical twists and turns, will keep middle grade fantasy/adventure buffs hooked. VERDICT Hand this title to fans of Roald Dahl.—Diane McCabe, John Muir Elementary, Santa Monica, CA - Copyright 2015 Publishers Weekly, Library Journal and/or School Library Journal used with permission. Booklist - 01/01/2016 Almost a decade ago, when she was only two, Lettie Peppercorn’s mother disappeared, leaving only a mysterious note behind. In his grief, her father turns to drink, so Lettie must run the White Horse Inn for the family, befriended only by the family pigeon, Periwinkle. When a stranger—an alchemist—appears one blustery night and creates something fantastically new called snow, the inn’s residents want the invention, believing it will make them rich. All Lettie cares about, however, is that the alchemist may know her mother’s whereabouts, and regardless of his unwillingness to cooperate, Lettie is determined to find her mother and reunite the family. What ensues is a magical adventure over sea, into icebergs, and around a whaling ship, reminiscent of Roald Dahl and Lewis Carroll. Bernatene’s illustrations help evoke the fully rendered setting and strange characters. This nonsensical and fantastical novel explores the ideas of family, sacrifice, and friendship, while celebrating the imagination. - Copyright 2016 Booklist.